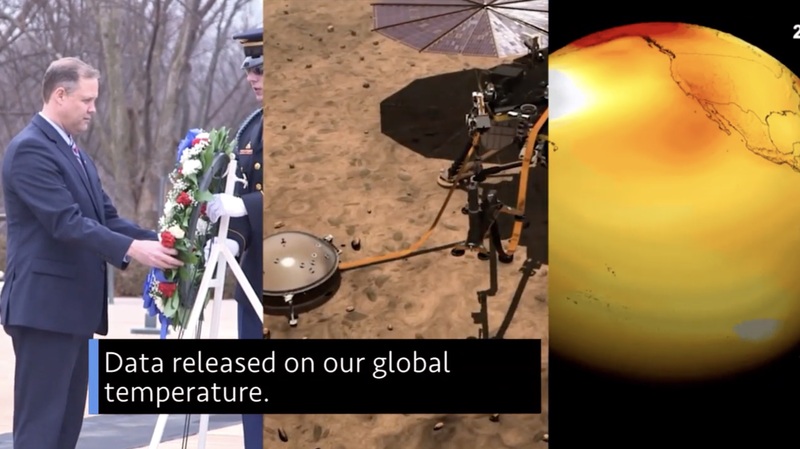 Remembering our fallen heroes … A milestone for our InSight lander on Mars … And, data released on our global temperature … a few of the stories to tell you about – This Week at NASA! On Feb. 7, our administrator, Jim Bridenstine was joined by Vice President Mike Pence and other senior NASA officials, for the annual observance at Arlington National Cemetery in Virginia held as part of the agency’s Day of Remembrance. The annual event pays tribute to the fallen astronauts of Apollo 1, space shuttles Challenger and Columbia, and other members of the NASA family who lost their lives supporting the agency’s mission of exploration and discovery. On Feb. 2, our Mars InSight lander deployed its Wind and Thermal Shield. The domed shield is designed to cover and protect the lander’s seismometer from winds and temperature fluctuations so it can collect accurate data. The supersensitive seismometer, which was placed on the Martian surface in December, will provide the first look at the deep interior of the Red Planet, to help us better understand how it and other rocky planets are formed. On Feb. 6, NASA and the National Oceanic and Atmospheric Administration provided the annual release of global temperature data and discussed the most important climate trends of 2018. According to independent analyses by both agencies, global surface temperatures in 2018 were the fourth warmest since 1880, the year modern global surface temperature record keeping began. The past five years are, collectively, the warmest years in the modern record. Our Kepler mission has released the final record of that spacecraft’s full field of view, before it ran out of fuel late last year and was retired to a safe orbit. The telescope was pointed toward the constellation Aquarius for this “last light” image, and captured glimpses of the TRAPPIST-1 and GJ 9827 systems. The blackened gaps in the image were caused by earlier random part-failures of Kepler’s camera and did not impact the rest of the instrument. Kepler opened its eyes to the skies more than nine years ago and went on to discover more than 2,600 worlds beyond our solar system, and statistically proved that our galaxy has even more planets than stars. After about three months attached to the International Space Station, the unpiloted Northrop Grumman Cygnus cargo spacecraft left the complex Feb. 8. The Cygnus – named after late astronaut John Young – delivered nearly 7,400 pounds of research and supplies to the station.